MPL AG, a long-term manufacturer of rugged Embedded Systems created a fanless Vision Server that can be used in severe environments. The solution integrates a rugged UPS and up to eight GigE ports on RJ45 or M12, four of them are available with PoE. 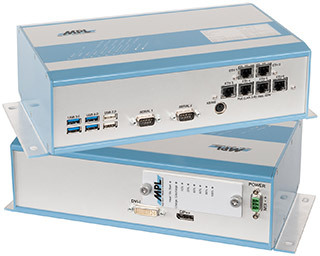 The new vision server is the perfect solution to connect PoE cameras in applications like public transportation, agriculture vehicles, or any other application for a rugged environment. In the solution, Intel mobile CPUs and LAN chips out of the embedded road-map are being used. This ensures long-term availability, but also long-time repair (typically 20+ years after introduction). The design of the board is done such, that all heat generating parts are directly mounted to the housing. This provides the best cooling and avoids heat pipes. MPL is providing this unique cooling concept successfully since more then 20 years. The PIP30 Family is designed such, that the Fit & Form still remains the same since the first PIP was introduced back in 1996. The PIP30 Family used as Vision Computer and Server, is specifically designed to withstand extreme environments. It starts with the design of the PCB and ends with the selection of the parts. The design experience and being active in this market since 1985, allows MPL to design such rugged and reliable solutions, customer have been depending on for decades. The input power of the solution is reverse polarity and load dump protected, even a redundant input can be provided. Input power ranges from 9-36VDC, optionally any other voltage. For the typical input power variations on vehicles, a MPL designed UPS system (BOLERO) is integrated. Four LAN ports with PoE are provided to connect cameras. The power supply for the PoE is as well a integrated part of the vision solution. For archiving, mass storage devices are built-in and can be configured as RAID if needed. WLAN and GPS are implemented as well. A total solution that can be operated in extended temperature, fanless, and rugged enough to withstand shock and vibration. Next to the mentioned features, the vision computer comes with a large set of interfaces such as USB (3.0 and 2.0), serial ports (RS232/485), or a special ignition interface, just to name a few. This rugged vision solution is offered in the standard PIP housing as well as in IP65 housings, or as open frame version for integration in an existing enclosure or cabinet. The solution is designed to meet standards like EN50155, IEC-60945, or MIL-STD-810G, just to name a few. The solution is EN50155 certified and “E” approved, and is already being used in agriculture applications, on public transportation systems, as well as for monitoring remote industrial areas.